Posts tagged "expensive watercolor paints"
The past week was a really busy one. I spent most of the time busting rocks and grinding them to powder. Why? To make paints! You’ll know why I say they’re worth their weight in gold after you read the rest of this post. I mostly did the nice, colorful rocks but I also did some of the gray shale and a few chunks of wood char for gray and black colors. When I began this post I was going to give a day-by-day recap, but I can’t remember what I did on Monday. So I’ll start with Tuesday. On Tuesday my huge wall calendar came in the mail. I wanted this so I could plot out next year with festivals and shows to go to with my paints and paintings. I want to find some good shows so that when Rob comes home from his contract we won’t have to do so much trial and error finding the good ones. After I hung the calendar, I went out and gathered some rocks and started the week off with a bang. Busted my chopping block that I’d used for cracking rocks. But I’d gotten a lot of rocks busted before this happened. Figured I’d better find a better way after that, though. I started doing the initial cracks on a rock outside. What I think I really need is a nice, big, thick granite slab! But for now, this little square rock seems to work well enough. The rock I use to test smaller rocks to see what colors are inside when I’m looking for good earth pigments. By Thursday, I knew exactly why those little paints on Etsy were so expensive. They really were worth their weight in gold. But by this time, I was hooked and there was no turning back. I just had to gather all the colors I needed to make the painting I want to make next week. So I gathered a little of the red, a little of the pink, yellow slate from the clay slide hill (this one was very hard to crush), and some of the gray slate from down in the creek – this one worked wonderfully! It made a black paint so smooth and creamy it felt like whipped cream. Usually I strain them all once the media has had time blend with the dust, but this one didn’t have any grit left in it at all when I finished mulling it. Finally. My Own Little Pans Worth their Weight in Gold. When I first started looking at making handmade watercolors I looked at the ones over at Etsy. They were expensive! Now I know why. It takes a lot of blood, sweat and tears to produce a full set of colors. But oh, my, I have never found any work as satisfying. Except finishing a painting that went as imagined. I have to say that feels even better. The first completed Wild Ozark palette of colors. All are sourced right here at home except the French green clay I used to make the last one. The journal of stones, some of the ground pigment from one of the red sandstones, and the finished palette. The pigment appears to be a brighter red than it really was. On Friday night I went to bed worn out, sore, and glad to have reached my goal of a palette worth its weight in gold.. I wanted to have my finished palette made so I could have the grand-girls over on Saturday night. As I get time, I’ll make a blog post when I do each color so you can see all the steps involved. If you want to know when I have some more palettes done and put them up to sell, sign up for the Wild Ozark newsletter. Or follow me on FB or Instagram. I’ll also have dry pigments for those who want to make their own paints, minus a lot of the work. Sooner or later I’ll have a workshop on how to make paints. I gathered as much information as I could online but there isn’t a lot on how to actually ‘do’ it. I’m constantly learning something new and the #handmadewatercolor and #earthpigment posters at Instagram have been incredible sources of inspiration and information. One thing I do know is that the colors work great on the paintings I’ve made. 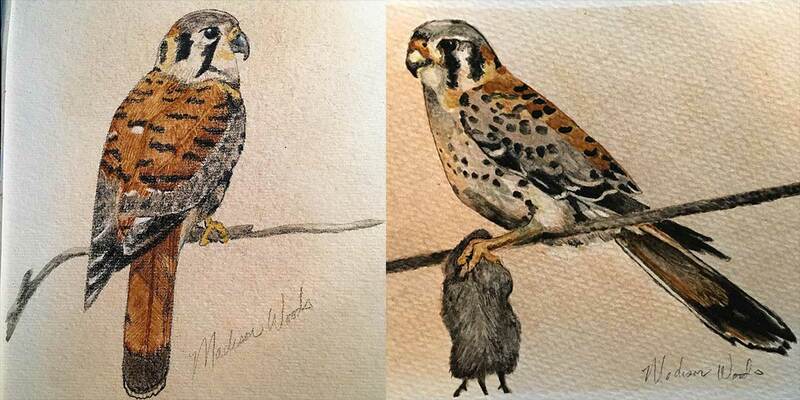 You can look back in the blog to see the Study in Sandstone and the Kestrel on a Line I did with the first set of paints I made. In the meantime here’s a quick outline. mix the powder (earth pigment) with the watercolor media (made from gum arabic and honey and clove essential oil). There’s a tool called a muller to use for this. It’s like a flat bottomed pestle that you use on a sheet of glass or slab of marble to mix the pigment with the media. But you don’t have to use the muller. I don’t mind if my paint has darker pigment that settles to the bottom of the pans because then I can choose to use the darker or the lighter shades when I’m painting. put the paint in pans. If it’s too grainy still, I filter it through a section of pantyhose. it doesn’t just ‘pour’ through, it has to be twisted and put under pressure. once in the pans, the rest of the paint is stored in a tightly closed jar. as the pans evaporate the paint volume shrinks and I add more paint from the jar to the pan until the pans are full when completely dry. When I first started this obsession, I tried making some paints with plants, too. They looked great, and still do as long as they don’t see the sun. But those paints are called ‘fugitive’ for a reason – they run from daylight. The only one that hasn’t faded is the one made from sassafras leaf and now I can’t remember how I made that one. The second attempt did not yield the same bright yellow. And so today the grand-girls came over to spend the night. What does Karter want to do? Karter picking up where I left off.